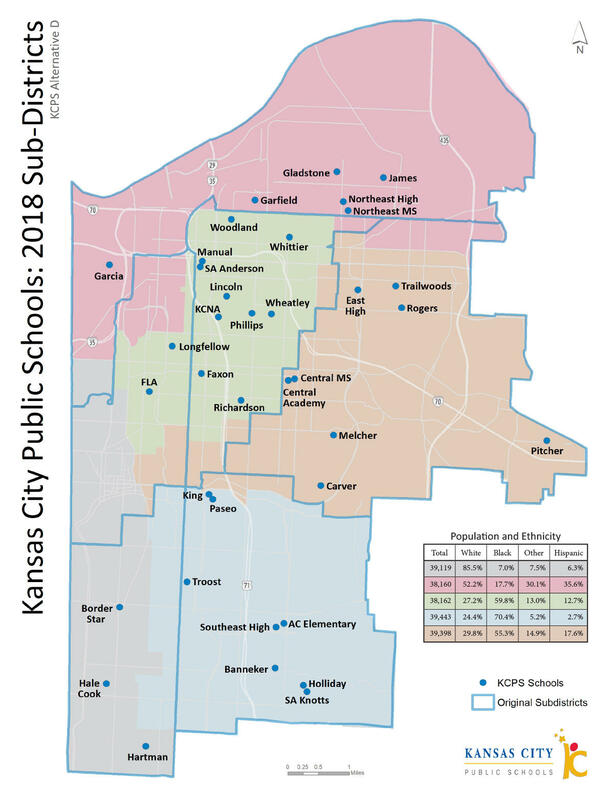 Ahead of a state-mandated redistricting of school board seats, the Kansas City Public Schools Board of Education has put forth its own map suggesting how the boundaries should be drawn. The proposed map builds on the work of three consultants hired by the Kansas City Board of Election Commissioners and incorporates community feedback, KCPS Board of Education Chair Melissa Robinson wrote in a letter to commissioners. Most Missouri school boards have seven members, and a 2013 law requires the nine-member KCPS board to eliminate one subdistrict and one at-large seat by April 2019. Because all seven seats will be open at the same time, voters could install an all-new school board. That’s injected uncertainty in a time of relative stability for the district, which is on the cusp of regaining full accreditation from the state. Click here for KCUR's notes on the four proposed maps. All three maps proposed by the KCEB consultants move neighborhoods east of Troost into subdistricts with neighborhoods west of Troost. Robinson told KCUR that’s concerned some community members, which is why the school board ultimately decided to propose its map. “A lot of folks felt like it wasn’t the right time to have school boundaries crossing that line in our community,” Robinson said. Stacey Daniels-Young, the former director of the Jackson County Community-Backed Anti-Violence Tax, more commonly known as COMBAT, has helped draw these kinds of maps before. Since she retired, Daniels-Young has worked as a community psychologist. With input from six black community groups, Daniels-Young proposed the map the school board ultimately endorsed. “We say that a lot, that we want to erase the Troost dividing line, but it is in fact a reality that people live different on the other side of the line,” Daniels-Young said. It matters because for decades, an all-white school board governed the majority-black district, and white voter turnout usually surpasses black voter turnout, especially in local elections. Bringing majority white voting blocks into predominantly black subdistricts could give those neighborhoods an outsize influence. Today, KCPS is 54.7 percent black and 28.6 percent Hispanic. There’s something else about the process that has Daniels-Young concerned: it’s been eight years since the last census, so the population data being used to draw the maps is dated. So it doesn’t account for trends the 2020 census will capture, like the explosion of luxury housing downtown. “Why are we drawing a map with 2010 data to use in a 2019 election?” Daniels-Young said. The NAACP, the Southern Christian Leadership Conference, the Urban League, Black Agenda Group, Urban Summit and Freedom Inc. all provided input for the map KCPS has proposed. The Kansas City Board of Election Commissioners is expected to make a decision Wednesday. They’re meeting at 12 p.m. at Union Station, Suite 2800, 30 W. Pershing Rd., Kansas City, Missouri.